For long historical years, Sapa becomes the home to stunning mountain landscapes, verdant rice terraces, unique stilt villages and the Indochina peak. Surely, you will enjoy the tours to Sapa from Hanoi in two days all the year round with different taste of seasons and exciting outdoors. We please offer to the detailed schedule of a trip in one of the most famous in Northern Vietnam to you. Our highest commitment is to bring you the most authentic and unique experience with a maximum of satisfaction. There are three methods to transfer to Sapa from Hanoi such as by bus, by train and by motorbike. The best way is by train because it ensures the safer and the quality service. 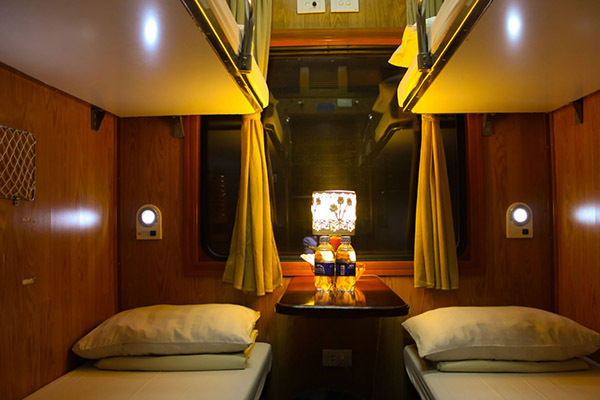 However, many foreigners choose the bus to move to Sapa as it stops directly in Sapa. Besides, the price of its ticket is cheaper and faster than by the train, it is nearly 9 hours. Otherwise, some foreigners who want to have a deep experience in the trip will get Sapa by motorbike to active the stopped points on the road. Thus, you can consider your situation to choose the best suitable methods in the tours to Sapa from Hanoi. After coming to Sapa town, you need to check in your accommodation like homestay, hotel, resort and then have a breakfast. Starting the trip with Cat Cat village and Shin Chai village which are the home to Black H’mong and Red Dzao located at the foot of Fansipan Mountain – “the Roof of Indochina”, where you enjoy stunning landscapes of the mountain. Cat Cat village is also the perfect place to see traditional clothing being made, hemp being dyed and women weaving. It is also a good opportunity to purchase some traditional souvenirs and handicrafts right from the craftsmen. 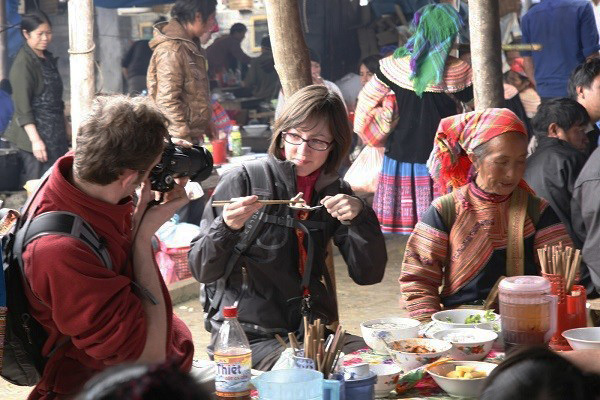 You will have the lunch cooked by the ethnic people. Then continuously, from Cat Cat we will follow the Muong Hoa Valley for 3 kilometers through rice terraces and small dwellings to Sin Chai. In Shin Chai village, local people will spend the time to teach textile weaving and dying and they take the group on a locally built trail. 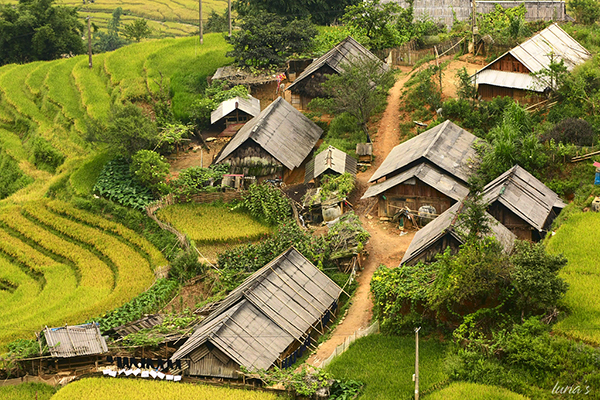 Moreover, you can grace the rice terraces which is one of the attractive points in tours to Sapa from Hanoi are built by competent hands of the Dao, the H’Mong, the Tay and more for hundreds of years. In May, Muong Hoa valley is blooming with lots of colorful flowers in a wide range of various beauties. Muong Hoa valley is one of the most famous destinations for breathtaking scenery and is the largest farmland for rice growing in Sapa, spreading over 4 kilometers length, 2 kilometers width with at least 159 stone. 6.00 a.m: You will come back to your accommodation and enjoy the exciting evening. You can walk around the town for shopping, see traditional dancing from ethnic people and music game show from government, love market on Saturday night, very colorful from love market. In Sapa, there are several local markets which open in each of day in the week. Therefore, you don’t worry about missed any markets during the coming time. For distance, Coc Ly Market opens on Tuesday which is a great place to buy traditional costumes and to learn more about the local culture. On Wednesday, Sin Cheng Market is a lovely small market in the Si Ma Cai district, where you can meet the many ethnics of the White H’Mong, Flower H’Mong, Giay, tay and Black Dao who sell the beautiful traditional costumes. Sometimes the market can be hard to reach due to road conditions. After one day, Lung Khau Nhin is located high in the mountains of the Tram Ton pass. Various small tribes such as the H’Mong, White Tai and Tai Lu are gathering to sell their products. There are two largest markets organized in the weekend like Can Cau Market and Bac Ha market. Can Cau market is located only 7 kilometers from the Chinese border, and just like the other markets, a fascinating and authentic experience. And Bac Ha Market is the most famous and biggest market of Sapa. You can buy several products, such as handicrafts, traditional costumes, and food. Various tribes are gathering at this market. Standing on Ham Rong Mountain, looking at the wonders of nature like vast heaven and earth and the majestic mountains from afar, you seem to feel so small. After that, you should go to Silver Falls as you will have an opportunity to immerse themselves in the romantic natural scenery majestic. The sounds of streams with birds make you feel like getting lost in the realm of Penglai. In there, you can see many stones with various sizes, ages and shapes, of course, you can collect on the foot of the waterfall.